July 2015: See what’s next in Chicago theatre – LeapFest’s first eleven years have so far graduated twenty plays to world premiere productions in Chicago and beyond, with three of these receiving the Jeff Award for Best New Work. Join us for a 12th smash year, when four new plays ("Byhalia, Mississippi," by Evan Linder; "The Bottle Tree," by Beth Kander"; "Good Friday" by Kristiana Colon; and "Love in the Time of Bumblehive" by Jeff Tabnick) “take the leap” in development in this three week festival of politically-minded new work. Each play will be presented in rotating repertory, and performances are followed by a discussion with the playwright and director. Leapfest takes place July 13-31 at Theater Wit, 1229 W Belmont, Chicago. Read an interview with Leapfest Playwright Beth Kander! 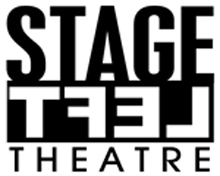 The Downstage Left Playwright Residency at Stage Left Theatre has is designed to help playwrights take a project from the conceptual stage all the way to a production-ready script. Playwrights work closely with one of our ensemble directors and members of the literary team to design a process tailored to the particular needs of their project. For the 2014-2015 cycle, playwrights Beth Kander and Gabriel Jason Dean were selected out of more than 100 candidates for this residency opportunity. Read more about their projects and pursuits here, or on Broadway World Chicago. Information on public readings and events will be available in the coming weeks. "Scrambled" Shines in "Wild Grown Stories"
Scenes from Beth Kander's "Scrambled" were included in a recent showcase by Jubilee Theatre Collective called Wild Grown Stories. Jubilee Theatre Collective, a Chicago theater company, is dedicated to improving literacy in the Mississippi Delta while shining a spotlight on the Mississippi storytelling tradition outside of the South. 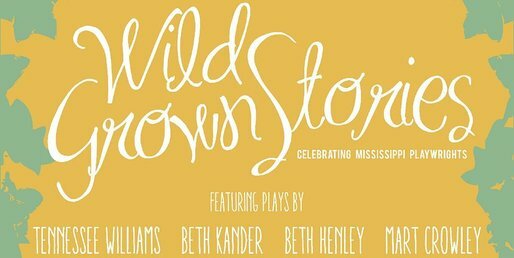 Wild Grown Stories: Celebrating Mississippi Playwrights was presented at the Den Theatre on Monday, February 24th and Tuesday, February 25th. As part of our social service initiative, all proceeds from Wild Grown Stories benefited PowerAPAC, a public school arts initiative in Jackson, Mississippi and purchasing required reading books for students at Yazoo High School. Jackson, MS - After sorting through more than 200 submissions of new plays, New Stage will present readings of three new plays in the Eudora Welty New Plays Series on Saturday, August 3 at 2:00 p.m. and Sunday, August 4 at 2:00 p.m. The readings are open to the public and admission is free. No reservation is required. THE SIXTH STAGE OF GRIEF, written by Brent Hearn of Jackson, MS and directed by Denise Halbach, will be presented on Saturday, August 3 at 2:00 p.m. What begins as a journalist's feature on a prominent woman dying of AIDS develops into friendship as the two women bond over one another's stories of love, loss, redemption, and perseverance. NUREYEV'S EYES, written by David Rush of Murphysboro, IL and directed by Chris Roebuck, will be presented on Saturday, August 3 immediately following The Sixth Stage of Grief. During the 70's the painter Jamie Wyeth (son of Andrew) did a series of studies and paintings of Rudolf Nureyev, the legendary ballet dancer who defected from Russia and revitalized western ballet. The play imagines what their times together may have been like, as each man somehow changes the other. 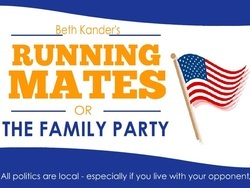 RUNNING MATES (OR, THE FAMILY PARTY), written by Beth Kander of Jackson, MS and directed by Francine Thomas Reynolds, will be presented on Sunday, August 4 at 2:00 p.m. Sam Storm has been mayor of Anderson, Georgia, for two decades. Most of that time, he’s run unopposed. But when he makes some misogynistic comments at a Stag Lodge meeting, his wife Sofia decides she’s had enough… and declares her own candidacy for mayor. Sparks fly, fueled by their respective uber-competitive (and respectively uber-conservative and uber-liberal) campaign managers, J.B. and Liddie. But when an unexpected third candidate enters the mix, they’re all thrown for a loop. All three readings will include a post-performance discussion with comments from respondent Joe Frost. The discussion will provide an opportunity for the playwrights to answer questions from the audience and the chance for them to "fine-tune" the play. There will be a reception following Sunday's reading in which the first, second and third place awards will be announced. SEE JANE QUIT Rocks Jackson, Richmond, Fort Wayne, and more! 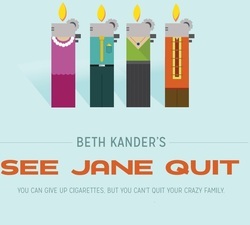 SEE JANE QUIT (available from Steele Spring Stage Rights) has been keeping audiences in stitches, from Jackson, Mississippi, to Richmond, Virginia, to Fort Wayne, Indiana and beyond! This addictive new comedy has garnered great reviews from audiences and critics alike. If there's not a production already scheduled to hit a theater near you, call Steele Spring and be the one to bring the hilarity to YOUR hometown! 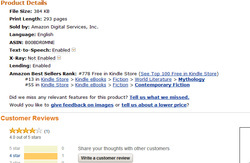 In just four days on Amazon.com, "Was" by Beth Kander was downloaded more than 900 times. The novel explores the power of storytelling through the mysterious and possibly even mystical friendship between downtrodden hospice worker Wilma Jones and her strange new patient, Mr. Was. Available for only $4.99 as an E-Book, "Was" will soon be available in hard copy form. Initial reviews are overwhelmingly ecstatic! The Fall 2012 issue of Southern Theatre Magazine features many great articles, images, insights - and also the first act of Beth Kander's Getchell Award-winning play, "Scrambled." There is also an interview with Kander included in the magazine, where she shares a little bit about herself, her writing process, and how "Scrambled" came to be. After reading the first act printed in the magazine, you'll be eager to get your hands on the second act. You may even be inspired to stage a production of the smart, funny, sensitive, and low-production-cost play. "Scrambled" is available for production via Steele Spring Theatrical Licensing. Our 48 Hour Film Project Moves on to Nationals! 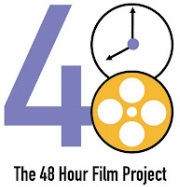 In September 2012, the 48 Hour Film Project team I was on learned that our little film ("The Retirement Party") totally swept the awards. In addition to winning best ensemble cast, best editing, best direction, best writing!! !, audience choice award, best sound design ... we also won BEST FILM, which means we advance to the national Filmapalooza festival in March 2013. And it we land in the top ten at Filmapalooza, our film goes all the way to France for the Cannes Film Festival. How incredible is that? Kudos, y'all! It was a fabulous team effort. 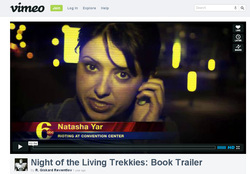 I'm the Face of the "Night of the Livving Trekkies" Book Trailer. I know. I was surprised, too! It's a blink-or-you'll-miss-me part. But if you want to keep your eyes open throughout, you can watch the awesome book trailer here. Southeastern Theatre Conference (SETC) is the largest and most active regional theatre organization in the United States. 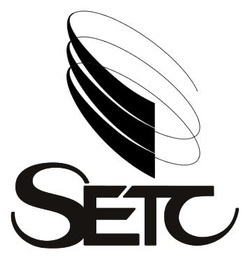 Founded in 1949 as a not-for-profit membership association, SETC has become the premier organization serving a wide constituency - all connected by theatre. On the playwriting front, SETC is dedicated to the discovery, development and publicizing of worthy new plays and playwrights. Each year, the Charles M. Getchell New Play Award is given to one playwright, and in 2012 the award went to Mississippi playwright Beth Kander. Kander's play, "Scrambled," was presented as a staged reading in March 2012 at the SETC convention in Chattanooga, TN. The first act of the play will be published in this fall's edition of Southern Theatre Magazine. Since I have several projects on-the-cusp - i.e. unfinished - I'm going to try to spend most of my writing-time getting those finished. THEN I'll feel justified in giving even more love to this website. In the meantime, I do have a few starter tidbits up on here about my books,plays, my blog - and yes, of course, you can follow me on Facebook** for more frequent updates. Thanks! **I know. I blame FB, and yet I remain. It's a really co-dependent situation.